Those who like to think that they are well versed when it comes to ‘The Wizard of Oz’ should know all about ‘Wicked’. Set in the same universe, the tale of Wicked is told from the perception of Elphaba, the infamous Wicked Witch of the West, and is one of the most watched and well-reviewed theatrical productions in the world. The production is simply beautiful, and the scenery created by the backstage crew is nothing short of amazing; its lavishly handsome design is accompanied by a powerful portrayal of the anti-hero Elphaba, and I would rate the musical a strong 4.5/5, particularly for its unmatched production value. It moves into a slightly melodramatic space towards the middle and there is a noticeable lag, but it quick recovers for a roaring final act which delivers in a satisfying manner. The fantasy/adventure production was originally based on the novel ‘Wicked: The Life and Times of the Wicked Witch of the West’ by Gregory Maguire, which itself was a swirled version of L. Frank Baum’s ‘The Wizard Of Oz’, and it was adapted to the stage by Stephen Schwartz in 2003, premiering on Broadway in October, and directed by Joe Mantello. At first the rights to the story lay with Universal, and Schwartz had to negotiate a deal in which Universal would co-produce with him, as they were impressed by his vision and the potential it held. Its initial production proved to be fruitful and the show was lathered with praise and accolades which aided its development across the globe, instigating the birth of its West End run in London. The musical itself follows Elphaba as she steers through the important aspects of her life such as University and her career ambitions. The story interweaves plot points from the original Wizard of Oz tale into its new saga, yet staging it from an entirely different point of view. Viewers watch as the Wizard of Oz labels Elphaba, a strong and determined woman who will not sit by and watch the Wizard destroy her world, ‘wicked’. Elphaba flees into hiding and the rest of the story begins to take conventions viewers will already be used to, and turn them upside down, creating an entirely new set of meanings. Some may find the political tone of the story to be slightly over-the-top, but it’s a creative addition to the production and the songs, composed and written by Schwartz, contain some glorious sing-along classics. The fan-favourite, ‘Defying Gravity’, is a sure-fire winner; rousing, heart-felt, and beautifully sung/written, it really has it all. Elsewhere, audiences will warm quickly to ‘Popular’, which is a real turning point in the story, and a playful song, sung in the original Broadway production by Emmy Award-winning actress Kristen Chenoweth. Other recognisable names from the original production include multi-award winning actor Joel Grey as the eccentric Wizard of Oz. Like many other musical productions, Wicked boasts an impressive array of musical pieces and stunning set design; what it lacks in story, it more than makes up for in colour and character. It’s perhaps intended for a slightly mature audience but it’s a smart and outgoing tale, worth the admission price. NY.co.uk rate Wicked the Musical in New York 4.5/5. 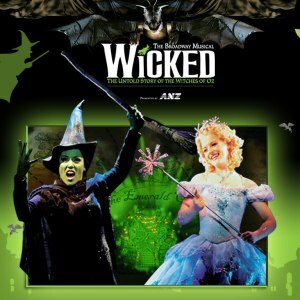 Wicked tickets are available from both Ticketmaster and directly from the theatre’s website; the Broadway production of Wicked is currently running at the Gershwin Theatre, New York, and the West End production is found at the Apollo Victoria Theatre in London.